My baking is often quite unorthodox. I start with a recipe, then change course mid-way, hoping it will work out. This time I had a basket full of beautiful, super-ripe apricots from a local orchard sitting on the counter. 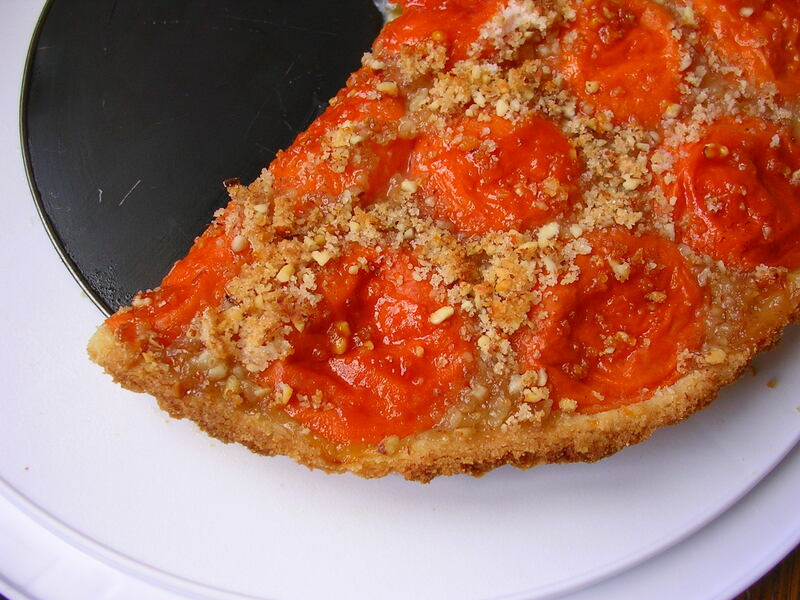 The apricots were so juicy that I feared the crust would turn soggy if I placed the apricots directly on the dough. So I turned the recipe upside down. I sprinkled the dough with the sugar-almond mix that was supposed to go on top, and made another batch of the almond-sugar mix for the topping. In fact the apricots were so juicy that as an additional precaution, I placed a jelly roll pan on the rack underneath to catch any drippings, and I am glad I did. 1. Place the flour and the butter in the food processor and process to a crumbly consistency. Add the sugar, salt and egg yolk and process until the dough forms a ball. Put the dough in a container with a lid or in plastic wrap and place in the freezer for 20 minutes. 2. Toast the almonds in an ungreased pan. Cool, then grind in the food processor with 1/3 cup sugar. 3. Butter a 9-inch tart pan (I used one with a removable bottom) and sprinkle with 1 tablespoon of the almond mix. 5. Roll out the dough between two pieces of wax paper to a 11-inch circle. Fit the dough into the tart pan with the dough coming up the sides. Trim extra dough with a knife or gently even it out by pinching it together with your fingertips. Sprinkle with half of the remaining almond mix. 6. Wash the apricots and dry well. Cut in half and remove the pits. Place the apricots on the dough cut-side down; they should fit snugly. 7. Warm the apricot preserves and strain them through a fine sieve and brush the apricots with it. Sprinkle with the remaining almond mix and bake in the preheated oven for 40 minutes, or until the crust is golden. Let cool on a wire rack.